Phantom black dogs, or ‘hellhounds’ as folklorists like to call them, are, despite the haziness of legend, manifest the world over. 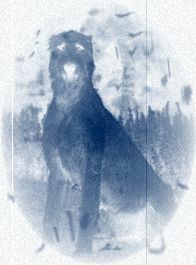 Across the United Kingdom such canid apparitions have been given many names – Striker, Padfoot, Roy Dog, Guytrash, and the most well known being Black Shuck. Most of these fiery eyed beasts appear to haunt rural or at least semi-rural areas, so you might think that London would be excluded habitat for these mysterious spirits. You’d be wrong. A black hound was seen during the 1960s on the Wandsworth Road. Researchers attributed the form to the ghost of an animal killed on the road. The hound would often bee seen disappearing into 523 Wandsworth Road. The haunting occurred for more than four months. But London’s most famous phantom hound is that which resides at the former Newgate Prison, a slithering, ominous spook which gives off a nauseating odour. Legend of the beast dates back to the reign of Henry III during a period of extreme famine when prisoners often fed upon one another. One victim of cannibalism, who was rumoured to be a sorcerer, claimed vengeance upon the inmates when a frightful, red-eyed phantom hound materialised in the vicinity. According to legend, the evil beast ripped many of the felons limb from limb, its blood soaked jaws dripping onto the icy floor. Other prisoners simply died of fright, terrified of the oncoming sound of padded feet in the corridors. The phantom hound was said to haunt the prison up until its demolition in 1902, yet sightings and strange odours are still reported, suggesting that this harbinger of doom is not confined to the dank annals of folkloric horror. Sources include London Walks and the Paranormal Databse.